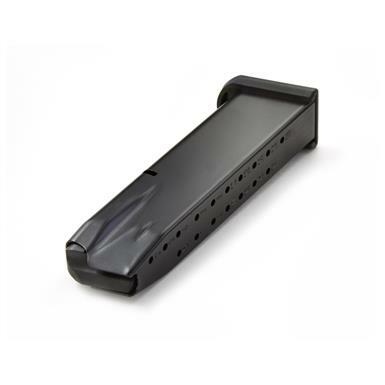 Beretta 92FS M9 Mec-Gar, 9mm Caliber Magazine, 18 Rounds is rated 5.0 out of 5 by 6. Rated 5 out of 5 by Oldgoat70 from Great product @ good price The fit into my 92FS just fine and fall out easily when mag release botton is pressed. Very good magazines. Rated 5 out of 5 by medmgr from Reliable Works just as well as the factory magazines that came with my 92FS but with 3 more round capacity each and almost half the cost of "Beretta" factory mags. Would not hesitate to purchase again even if I could get the factory mags for the same price. Rated 5 out of 5 by Jim Z from Very impressed! Rated 5 out of 5 by Larrybomber from Great Mag This mag fits just like the factory 15 round mag. Sticks out just a hair more than standard, but very hard to notice. It functions just great. The value is very good also. Rated 5 out of 5 by Mike from Mec-Gar 18 Rnd for Beretta M9 9mm Love the Mec-Gar 18 and 20 round magazines. I bought both, 18 and 20 rnd mags. The 18 is flush fit, works and looks great. The 20 rnd is the same mag but with a 2 rnd extension. The ext looks like it was made for the M9, has the lines just like the pistol grip. The finish on both mags match the pistol, and have M9 stamped in the side wall of the mag. Have not had any problems, would highly recommend these mags. I like the 20 rnd mag the best. These mags blow the Army 15 rnd mag away, no comparison. Rated 5 out of 5 by Michael from Nice mag for the price Mag looks very good, made in Italy. I did not try it yet, but hope it works as it should. High quality for sure shooting!